We can support and supplement the effects of the creams with the use of our soaps, shampoos and toothpaste. This combination is excellent for the body and makes our skin and teeth both vibrant and clean. We can also draw on this unique holistic range to devise a regular ritual for the cleansing of both the body and soul. Remember what makes our herbal creams exceptional is that we incorporate a colossal 50% herbal extract. Some of the vital ingredients include shea butter castor, linseed and soybean to name but a few. This Christmas we strive to offer our customers a unique natural cosmetic range of products and to leave the best news till last. With each purchase of €25 or more on their online shop, they will offer free shipping anywhere in Ireland and a free €25 voucher for any of our online products, redeemable up until the end of January 2019. 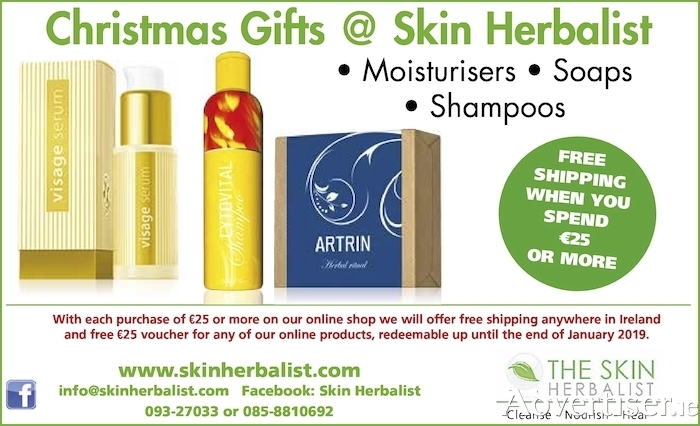 You can shop online now and avail of the great Christmas offers at www.skinherbalist.com or for more information call 093 27033, or email [email protected].